One week ago in Mountain City, GA. a small auto accident had a very unusual victim. When the wrecker operator came to remove the 2 cars there was an unexpected find. 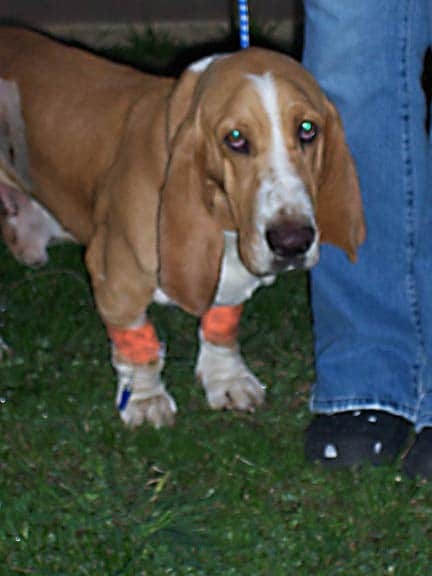 A common 3 to 4 year-old basset hound apparently had been an unfortunate bystander to the wreck. Being in the wrong place at the wrong time, he had been trapped under one of the vehicles and lay without a sound while the accident investigation and subsequent clean up was taking place. Until lifting one of the cars, a Chevy, onto the tow truck, he was discovered. His owner also a bystander was not especially concerned for his pet and having little or no resources to pay Vet bills told the wrecker driver to leave the dog at the site to die. The wrecker driver could not get the dog out of his mind. How he had been trapped for so long without a whimper and now laid helplessly to die on the side of the road. Unable to turn his back on the dogs suffering he picked him up and delivered him to Rabun Animal Hospital. Upon arrival with a severely broken rear leg a temporary splint was placed and he was medicated for pain and kenneled as required for the 48 hours awaiting euthanasia. Enter the newest member of the Veterinary Staff just fresh out of Vet school, Dr. Amanda Whitlock of Franklin, a Franklin High School Graduate. After hearing his sad story and evaluating the dog’s condition she took it upon herself to try to give this dog a second chance. She guaranteed the veterinary expense to the clinic even though she was already saddled with debt for her education and her own animals health conditions, and went to work. his bill and James needs a home! 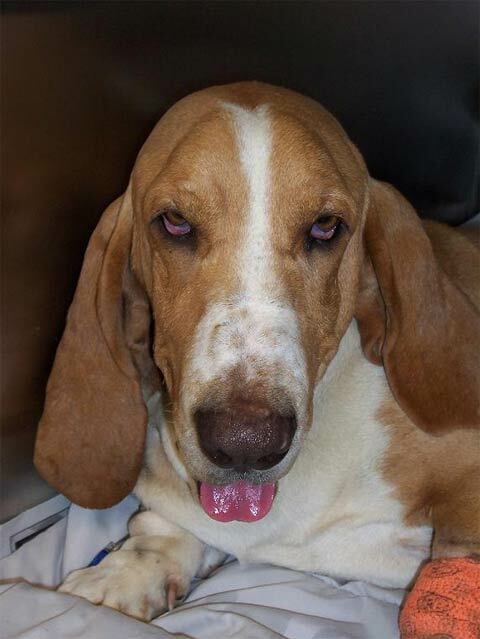 Contributions to James’ medical expense can be made to Rabun Animal Hospital under the name “James the Basset” at 220 Cathey Road, Mountain City, GA. 30562. People willing to consider providing James with a new and loving home can contact Dr. Amanda at the clinic at 706-746-5100. James is a loving dog, easily handled, and has made no effort to bite even when in great pain. He seems interested in cats but with no inclination to chase and has shown no dog aggression to date. 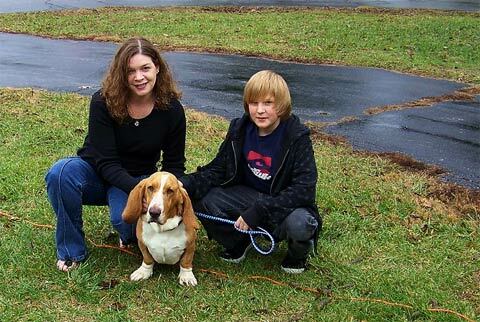 He will need a home that will permit him to have a quite uneventful life with plenty of love and a comfortable bed since that’s what all Bassets’ want even with 4 legs. He can be shipped if necessary but the cost would need to be bourne be his new home. James the newly 3 legged and thereby exotic (Exotic – adjective: strikingly strange or unusual) Basset Hound left for his new and permanent home early this past Saturday morning. After being trapped under a car in an accident, abandoned to die by the side of the road and rescued by a wrecker driver and a young veterinarian, James is finally headed out to his new home with Feline Conservation Federation member and exotic/wild cat owner Leann Montgomery in Kentucky. This is a very happy ending to a tragic story of a discarded animal but proof that good things can happen when people come together to help an innocent animal in a crisis.